Dr. Dhiraj B. Nikumbh, ACPM Medical College Dhule (India) and Dr. Sudhir Singhavi, Singhavi Hospital Dhule (India) for contributing this case and the discussion. To contribute a Case of the Week, follow the guidelines on our main Case of the Week page. Register for our upcoming course being held this June in order to learn the latest issues and tools affecting your practice this year. Our world-renowned faculty include, Brian Rubin, M.D., Ph.D., Elizabeth A. Montgomery, M.D., Justine A. Barletta, M.D. and Lynette M Sholl, M.D. (1) We have a new Get Involved button and page which lists all the ways you can help PathologyOutlines.com. It replaces the Contribute page. On 5 April 2016, we had 30,139 visitors, our second highest total (highest was 46,454 visits on 5 October 2015, during CAP 2015). (2) Each quarter, PathologyOutlines.com contributes 10% of income derived from our Amazon affiliate relationship to a charity. You can support these efforts by purchasing from Amazon.com, and using the links on any of our pages. For the first quarter of 2016, we received $3,789.07 from Amazon.com related sales, and forwarded $379.00 to the Flint Child Health & Development Fund, which helps deal with the aftermath of the lead poisoning due to our State governmental incompetence. For the second quarter of 2016, we will be contributing to the Detroit College Promise Scholarship Fund at the Detroit Public School Foundation. PathologyOutlines.com sponsored the Detroit College Promise from its inception in 2008 until July 2015, when it merged this program into the DPS Foundation, to assure long term stability and greater capacity to award scholarships. For the 2015-16 college academic year, we awarded 183 scholarships. We are pleased that for the 2016-17 college academic year, almost 1000 students have applied for scholarships, reflecting the great work done by the DPS Foundation staff. For that reason, it is especially important that all who support public education support these efforts. Besides purchasing from Amazon.com (using our links), you can donate specifically to this effort by clicking here. For questions, contact Dr. Pernick at NatPernick@gmail.com or the DPS Foundation at (313) 873-3348. 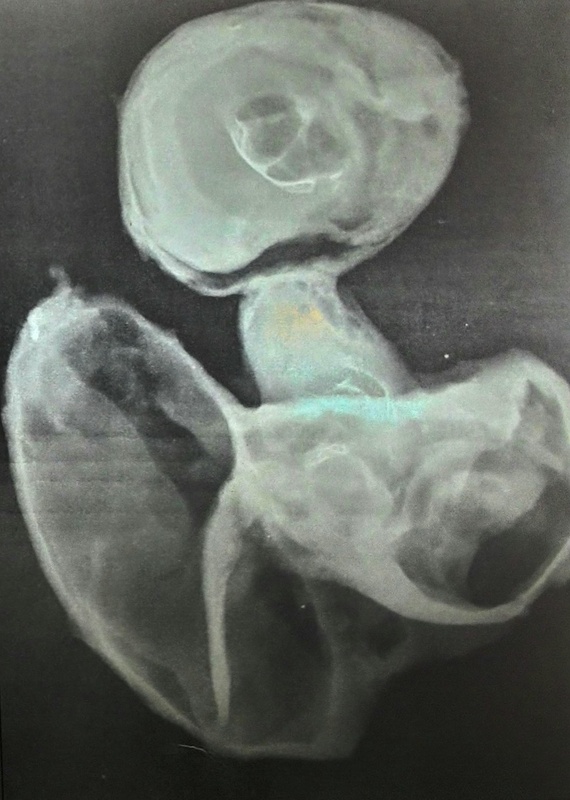 An 18 month old girl presented with abdominal distension and pain. 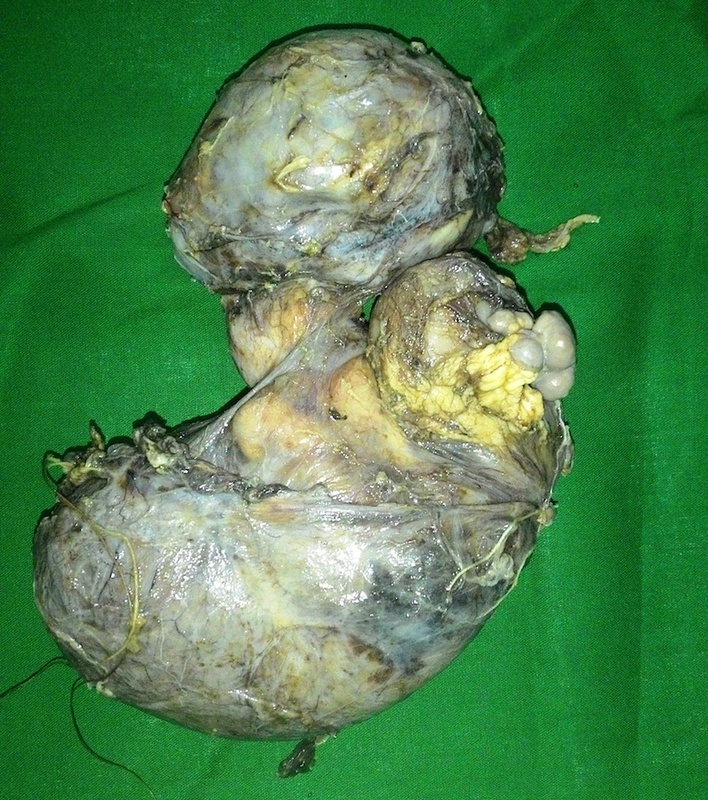 USG and CT scan were suggestive of a retroperitoneal tumor. Laparotomy was posted, and the specimen was excised. The mass measured 18 x 10 x 6 cm and weighed 910 g. The external surface was sac-like and smooth, with partial skin covering the upper region. Vertical cut section showed solid and large cystic areas containing mucoid material. The upper segment of the mass contained hair, pultaceous (pulpy) material, scalp and brain substance. The middle segment showed vertebral column, cartilage, intestine and grey-white solid areas. The lower segment contained a cyst with a flattened wall and limb bud-like structures attached to the external aspect. 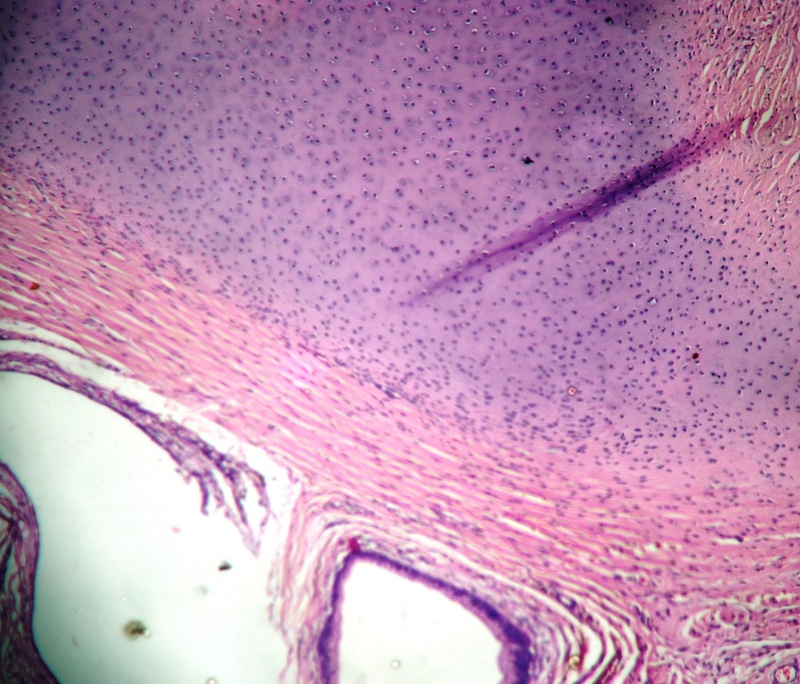 Histologic examination of the upper segment showed primitive brain parenchyma, cartilage and skin with adnexa and hair. 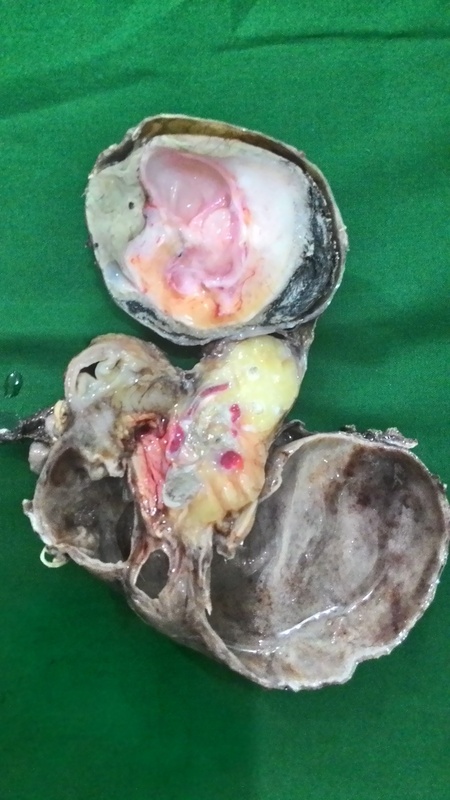 The middle segment contained stomach, duodenum, small intestine, vertebral column, bone and bone marrow, pancreas, soft tissue, lymph nodes and adipose tissue. 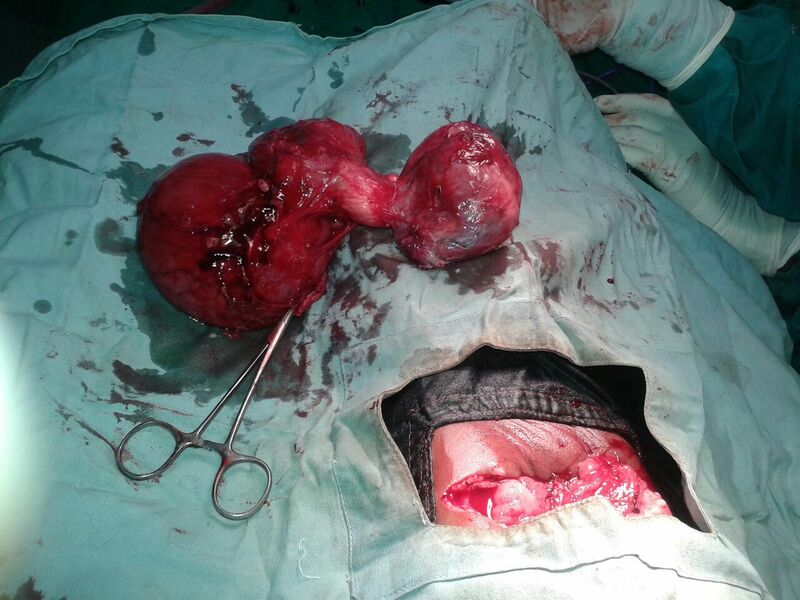 The lower segment contained a cyst wall with flattened lining and no adnexal structures. Fetus-in-fetu (FIF) is an extremely rare pathological condition with an estimated incidence of 1 in 500,000 births. Less than 200 cases have been reported worldwide. To our knowledge, FIF was originally described by Meckel in the 18th century. Subsequently, Willis described it as rare condition in which a malformed parasitic twin was found inside the body of its partner, usually in the abdominal cavity. Willis defined FIF in 1935 as a "mass containing a vertebral axis often associated with other organs or limbs around this axis" (Willis: The Borderland of Embryology and Pathology, 1962). The presence of a vertebral axis in a fetiform mass has since been considered pathognomonic of FIF. Although several theories as to the pathogenesis of FIF had been proposed, the "twinning" theory has become accepted, as the mass is always found enclosed within a sac resembling the amniotic sac - in fact, the lining of the sac histologically resembles the amniotic membrane. 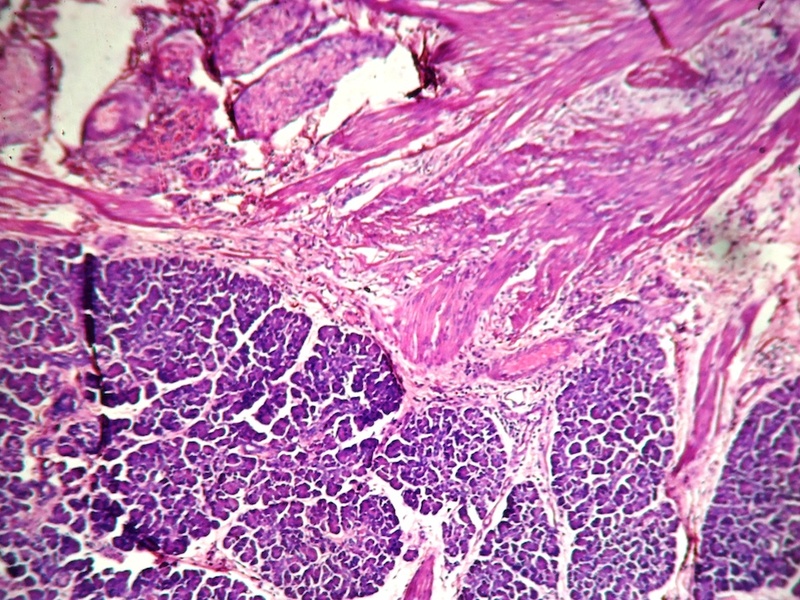 Of late, Spencer has proposed that one or more of the following criteria needs to be present to label any fetiform mass as FIF: (1) the mass must be enclosed within a distinct sac, (2) it should be partially or completely covered by normal skin, (3) it should have grossly recognizable anatomic parts, (4) it should be attached to its host by only few relatively large blood vessels, (5) it should either be located immediately adjacent to one of the sites of attachments of conjoined twins or be associated with neural tube or the gastrointestinal tract (Clin Anat 2001;14:428). In our case, both the criteria of Willis and Spencer were fulfilled, and thus the diagnosis of FIF was made. The clinical differential diagnosis of FIF includes other retroperitoneal masses such as neuroblastoma, Wilms tumor, teratoma and hydronephrosis. The main diagnostic challenge lies in differentiating FIF from retroperitoneal teratoma, which contains pluripotent cells without organogenesis or vertebral segmentation. This distinction is important as the latter can be associated with risk of malignancy. The most important feature that has been used to distinguish between FIF and teratoma is the presence of the vertebral column. Surgical excision is curative, although the presence of immature elements indicates the need for close clinical, radiological and serological (AFP) follow-up.